This education kit was produced for the exhibition The photograph and Australia (Art Gallery of NSW, 21 March – 8 June 2015). It presents text from the exhibition along with issues for consideration for students in Years 7-12. Photography has played a crucial role in understanding Australia as a place and Australians as a people. Since its first introduction in the 1840s, photography has been used as a tool of documentation and self-reflection, helping to forge relationships between people and place, individual and society, past and present. The photograph and Australia poses questions about how Australia has been represented and imagined through photography. Many facets of photographic practice are represented, from the earliest extant daguerreotypes of 1845 to the circulation of digital images in 2015. Collectively, these images trace the evolution of the medium and its many uses, from the documentary and commemorative to the speculative and conceptual. Weaving together the multiple threads of Australia’s photographic history, the exhibition proposes a new way of thinking about the connections between photography, place and identity. This exhibition explores four themes: settler and Indigenous relations; exploration; portraiture; and transmission, spread over nine rooms. Portraits of photographers reveal the people who produced the images that make up the history of photography in Australia. In the 19th century, photographers were from diverse economic, social and professional backgrounds. 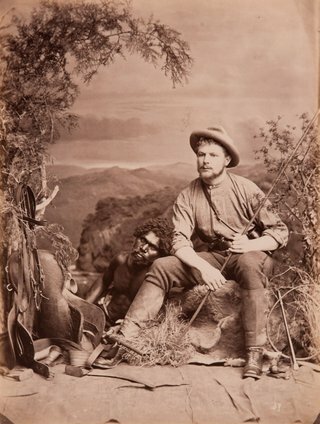 Many professional practitioners were itinerant and travelled between remote towns in search of business, photographing scenery for trade, or setting up makeshift backdrops to photograph sitters. The demand for photography was high during this period, particularly for portraits. Yet the competition between studios saw them frequently undercut each other in price, or advertise better amenities and faster results. In the 20th century, the rise of documentary photography and photojournalism reinvented the photographer as a witness to daily life and historical events. Contemporary artists, however, have used the medium to reflect on personal and political histories, drawing attention to the constructed nature of photography and its mediated relationship to reality. Photography gives us access to things beyond our immediate experience, bringing faraway places within reach of the imagination. Technological developments – such as the invention of the dry plate in 1871 – substantially increased the medium’s portability and scope, allowing photographers to document nature in dynamic ways. Frank Hurley, for example, captured the grandeur of Antarctic ice formations during the intrepid Douglas Mawson expedition of 1911–12. Picturing nature is not a straightforward process, however, as it involves selecting, framing and constructing a view with an intended effect. Melvin Vaniman’s panorama of Fitzroy Vale Station depicts the fields of the Queensland Meat Exporting Company as a pastoral arcadia. David Stephenson’s photographs of stars, on the other hand, draw on the aesthetic category of the sublime. His long exposures of the night sky register the movement of the earth, turning points of light into delicate lines. The history of photography is characterised by an overwhelming multiplicity and mutability. Proliferating technologies in the 19th century resulted in daguerreotypes, ambrotypes, stereographs, tintypes, and paper photographs, as well as different forms of presentation to protect and display them. The diversity of photography engenders many kinds of viewing; while we gaze at prints on a wall, we might hold a tiny daguerreotype, or leaf through an album. Photography privileges vision yet has a tactile intimacy. Despite their physical variety, all photographs function as repositories of memory, creating personal, social and political histories. Portraits trace family relationships and social networks, while official albums record and commemorate public events. Photography also offers a way of critiquing history. Tracey Moffatt and Ricky Maynard have used it to re-imagine the past and reclaim the image-making of Aboriginal people, creating nuanced images of community and country. Photography was a key part of the project of colonisation and was used to document its progress. Burgeoning towns, newly-built estates, local scenery and Aboriginal communities all came under the scrutiny of photographers. They included amateurs like John Hunter Kerr, George Story and Morton Allport, who created an eccentric, personal record of Tasmania and Victoria’s growth in the 1850s and ’60s. Places of confinement, including gaols and asylums, were key expressions of the colonial social order. Photographs of these institutions represent the exercise of the law and the control of marginalised members of society. The great human cost of colonisation may be seen in Charles Woolley’s and Frederick Frith’s portraits of the Old People at Oyster Cove. It is also explored in Anne Ferran’s photographs of the undulating ground at the site of the Ross Female Factory – a workhouse for women prisoners and their children. Australia’s colonial towns expanded and prospered in the second half of the 19th century. Exploitation of gold and wool bolstered the economy, while the development of railways, post offices and telegraph lines improved travel and communication, fostering a sense of communal identity across the country. William Bardwell, Davies & Co, and Fred Hardie photographed the growth of Melbourne and Ballarat for world exhibitions, capturing their buildings, commerce and cosmopolitanism. The encroachment of European society had a destructive impact on Indigenous peoples. Missions like Poonindie and Coranderrk were established to create self-sustaining and productive Aboriginal communities; photographs by Fred Kruger and Samuel Sweet emphasised their industry and order. These images can now be seen as documenting the survival from colonisation and dispossession. Similarly, Paul Foelsche’s ethnological portraits and JW Lindt’s staged tableaux have been reinterpreted as valuable evidence of family history. Photographic forms and practices in Australia evolved to keep pace with modernity. The discovery of gold in New South Wales and Victoria in the 1850s and Western Australia in the 1880s transformed convict colonies into modern cities, drawing people from all over the world. Photographers were lured to gold towns such as Hill End, Bathurst and Kalgoorlie, where they documented the people, life on the diggings and discoveries in the mines. Wealth from mining also directly sponsored photographic projects. In 1875 the prospector BO Holtermann commissioned a mammoth panorama of Sydney, which required the world’s largest glass plates. Such ambitious new technologies expressed the optimism and aspirations of the colonies. Many photographs taken in the 19th century were displayed at world exhibitions to demonstrate the progress of the Australian outposts of Empire. They also suggest a self-conscious appraisal of Australian identity and experience. By the early 1900s, strength, athleticism and a love of the outdoors had come to publicly define Australian life. These ideals developed in the wake of World War I, when the country was recovering from tragic losses in Europe. 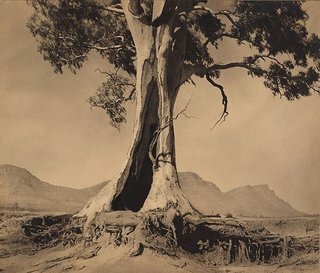 They were perpetuated in the photography of Harold Cazneaux, Keast Burke, Olive Cotton and Max Dupain, whose light-saturated images reflected on the unique characteristics of Australian landscape and experience. The narrowness of these myths about Australian identity was powerfully critiqued in the 1960s, ’70s and ’80s. Photographers David Moore, Mervyn Bishop, Carol Jerrems and Michael Riley thrust the diversity of life in Australia into the spotlight, insisting on its migrant origins, subcultures, powerful women and the survival of Aboriginal culture. Photography has the power to make visible that which ordinarily goes unseen. 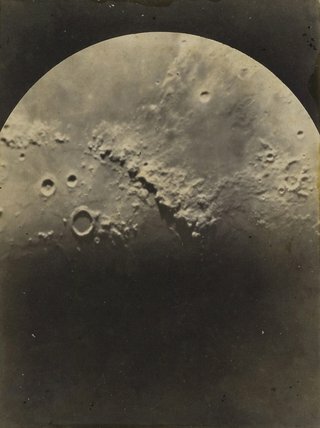 From the 1870s onwards, the Sydney and Melbourne observatories used star cameras to document distant planets, star clusters and cosmic events. Driven by curiosity about the natural world, Launceston chemist Frank Styant Browne made the first Australian X-rays in 1896, revealing the internal network of human and animal bodies. For contemporary artists Simryn Gill and Sue Ford, photography allows the visualisation of unfolding time. Gill’s aerial photographs depict mines that excavate layers of geological history on a massive scale, taking us back millennia. Ford’s intimate self-portrait, on the other hand, is a serial documentation of her life as a photographer over many decades. Here, identity is not singular or fixed, but represented as multiple – the product of past experiences and actions. The photograph is defined by its capacity for reproduction, repetition and dissemination. In the 1860s, advances such as the albumen process and multi-lens cameras substantially increased its reproducibility. Popular cartes de visite (small paper prints on card) of any subject imaginable, proliferated all over the world. First used as a substitute for the calling card, they were avidly collected, often in albums that presented a desired social network of family, friends, acquaintances and celebrities. New technologies, such as digital photography and the internet, continue to speed up and expand the dissemination of the photograph. A single image can now migrate between many formats, appearing in a book, an album, a frame, on screen or online. Artist Patrick Pound has suggested that all the images in the world, digital or physical, now make up a vast, unhinged album – a floating archive of things, spaces and experiences. The Gallery’s senior curator of photographs, Judy Annear, has said of the exhibition: ‘Audiences are invited to experience the breadth of Australian photography, past and present, and the sense of wonder the photograph can still induce through its ability to capture both things of the world and the imagination.’ Using your own words, describe what she might mean by ‘the sense of wonder the photograph can induce’. What choices and decisions has the curator made in relation to the selection of photographs for this exhibition? Imagine you were asked to curate an exhibition entitled ‘The photograph and Australia’. How would you go about doing this? What works would you include and why? 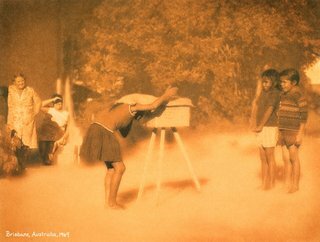 Has photography played a role in forming ideas of what Australia was, is and might be? How do you define Australia today? Debate in class the proposition: Photography invented modern Australia. 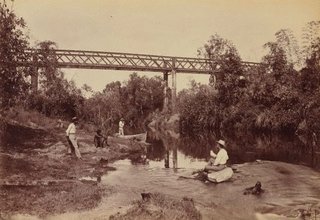 Choosing specific examples in the exhibition, explain how photography has been used to document the process of colonisation, including the expansion of colonial towns, the exploitation of gold and wool and the construction of railways, post offices and telegraph lines. Do the images reflect the impact of these developments on the Australian economy and society; and if so, how? What is the particular power of photography? How does it differ from other art forms? Is one medium more 'authentic’ than another? Debate whether photography is better placed than others to represent the identity and character of a place, a people, an experience, a moment in time. Research various photographic techniques in this exhibition, such as daguerreotypes, ambrotypes, stereographs, tintypes and paper photographs. How do they compare with digital techniques? Collect examples of historical and contemporary photographs and discuss the challenges that photographers may have faced in their era. Describe the different ways we might engage with a photograph, eg leafing through an old album, sharing an image on social media. Is there a difference between the visual and tactile elements of engaging with a photograph? Analyse the diverse forms of presentation you can see in this exhibition. How does the display and placement of the objects impact on their meaning? Is there a difference between the display of historical and contemporary works? 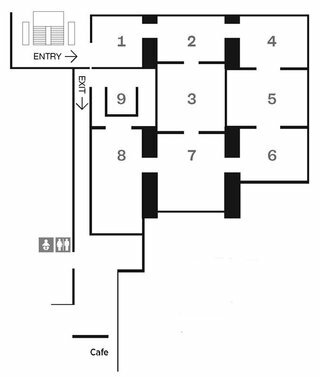 In your response, consider room 3 (People and place) in particular. Consider the role of the photographer. Is their aim to convey reality or is there something more that is being explored? How do they impact the way we perceive our world? Consider the constructed nature of photography in selecting, framing and presenting an image. Choose an image from the exhibition to develop into a case study of photography’s mediated relationship to reality. Why are we, as human beings, so obsessed with our own image and our relationship to the past, present and future? Calculate how many photographic images exist of you, over time, in the world. Consider how you feel about this. 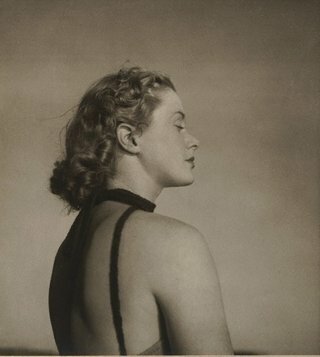 Discuss whether the personal/private use of photography has impacted the value placed on the individual in our society. What is meant by ‘the great human cost of colonisation’? Research prevailing attitudes in 19th-century Australia towards Indigenous culture, which regarded Aboriginal people as ‘primitive’ and a ‘dying race’. Are there works in this exhibition that reflect this attitude? What impact might these views have had on Indigenous people then and now? Since the mid 20th century, Aboriginal people have taken greater control of the camera and used it as a tool for self-determination and artistic expression. How have artists such as Tracey Moffatt and Ricky Maynard re-imagined the past? Compare their images with depictions of Aboriginal people by 19th-century photographers such as Charles Bayliss and JW Lindt. Discuss what is meant by the statement: ‘Photography has the power to make visible that which ordinarily goes unseen’. Consider the relationship between science and photography. What is the role of photography in scientific research? Collect information and examples from this exhibition. What is it about the photographic process that has excited both artists and scientists? Does photography easily straddle the realms of the functional and the aesthetic? Is there a difference in selecting, framing and constructing a view in relation to these realms? Discuss. List some the technological developments – such as the invention of the dry plate in 1871 – that increased photography’s portability. Describe the process of photography before each of these developments, and the impact they had on photographic practice. Can you see a difference within the images themselves? 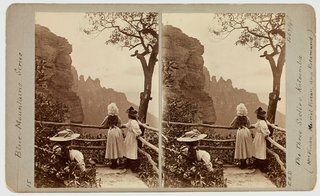 What impressions do you think people overseas had of Australia in the 19th century through viewing images at world exhibitions? What did these images convey about the Australian identity and experience at that time? How is the image of Australia formed on the global stage today? What are the differences and similarities between these contemporary and historical impressions? Analyse the connection between cartes de visite and our engagement with photographic images today. Compare the differences and similarities in relation to collection and dissemination. Albums of cartes de visite presented a desired social network of family, friends, acquaintances and celebrities. How does this relate to today’s world and how we image ourselves? How were people recorded before the invention of photography? Consider those who were and were not recorded. Discuss the power and importance of the human face in our relationship with others and our world. Research some of the 19th-century photographers in this exhibition, including their background and roles. Why do you think the demand for portrait photography was high during this period? Discuss the differences and similarities between photographic portraits and other art mediums. 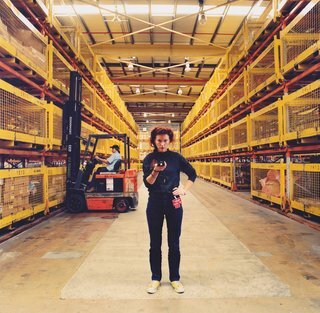 How have contemporary artists used photography to reflect on personal histories? Create a photographic portrait of a family member, friend or classmate. Make choices about their pose, expression, clothing, environment and whether to include any other objects, as well as the style of the work. Invented in 1850 by Louis-Desiré Blanquart-Evrard, the albumen photograph was the most prevalent type of photographic print until c1890. It was made by floating a sheet of thin paper on a bath of whisked, filtered egg white containing salt. After drying, the paper was sensitised, exposed (often in contact with a glass negative), and the resulting print fixed in a solution of hyposulfite of soda (‘hypo’), washed and toned. The resulting prints range in tone from reddish to purplish brown and tend to curl at the corners. An ambrotype is a unique negative on glass, which is backed with a dark opaque substance to create a positive image. Invented in 1851, ambrotypes had superseded the earlier daguerreotype in the late 1850s but were overtaken by tintypes and cartes de visite in the 1860s.Ambrotypes looked similar to daguerreotypes but were easier and cheaper to produce. Patented by Joseph Wilson Swan in 1864, the autotype was a photomechanical technique for reproducing photographs. It involved a carbon-transfer process and resulted in rich, detailed images with deep contrasts of light and dark. Patented in 1855 by Alphonse Louis Poitevin, the carbon photograph was popular between 1870 and 1910. The process involved coating a sheet of paper with a gelatin emulsion containing gum bichromate and carbon black, which was then put in contact with a negative and exposed to light. The resulting highly durable paper print exhibited dense, glossy, dark areas with slight relief contours. The wet-plate collodion process was invented in 1848 by F Scott Archer. It was prevalent from 1855 to about 1881. The collodion used to coat glass plates was made from cotton soaked in nitric and sulphuric acid then dried. This was then dissolved in a mixture of alcohol, ether and potassium iodide and poured onto plates as the first step in the production of negatives. There are two main modern colour processes: type C and type R. Type C photography is the most common and involves printing colour paper enlargements from colour negatives. In the R (for reversal) type print, a positive slide or transparency is printed onto type R paper to give exactly the same colour saturation as the original image. Both type C and type R paper are composed of three main dye layers: cyan, magenta and yellow. A unique positive image on a sheet of polished silver-coated copper, the daguerreotype was announced by Louis-Jacques-Mandé Daguerre in 1839, and became wildly popular as a medium for portraiture until the mid 1850s despite the expense and difficulty of production. The process, using iodine and mercury, was toxic, but the resulting clarity was highly prized. Daguerreotypes came in standard sizes which were fractions of a plate (measuring 16.5 x 21.5 cm), and varied from a whole plate to a sixteenth plate (3.5 x 4 cm). The dry plate is a thin sheet of glass or metal coated with a light-sensitive emulsion and dried prior to use in-camera. Invented in 1871 by Richard Maddox, this kind of plate was widely used by the 1880s as a practical alternative to the wet plate because it could be transported, exposed, and then processed at a later date. In the 1870s paper coated with gelatin containing silver salts was introduced for making black-and-white prints from negatives, and is a product still in use. By 1895 such paper had superseded the albumen process because it was more stable and simpler to produce. Invented in 1873 by William Willis, platinum papers were sensitised with chloro-platinate and ferric oxalate, contact-printed from a negative, then developed and washed. Also known as platinotypes, they were valued for their tonal range, expanded mid-tone greys, and permanence. Platinum was popular until the 1920s when the price made it prohibitive and it was replaced with the cheaper palladium. A matte-textured, reddish-brown print made by direct contact with the negative. Invented by William Henry Fox Talbot, salt prints were made by sensitising a sheet of paper with sodium chloride and silver nitrate, placing it under a negative, and exposing both to light. The print was then fixed, washed and toned. They are often confused with single layer albumen photographs. Patented in 1856 by Professor Hamilton Smith in Ohio, United States, the tintype is a unique image made on a thin sheet of iron coated with a black or brown lacquer or enamel. An inexpensive and popular process often used for portraits, it has a limited tonal range and images appear flat and soft. The wet plate is a thin sheet of glass coated with a light-sensitive emulsion and exposed in the camera while still damp. Invented in 1848 and prevalent from 1855 until c1881, wet-plate photography was valued for its detail and, in comparison to daguerreotypes and calotypes, its reduced exposure times. The process was complex and involved coating, exposing and processing the plate within a short window of time and photographers had to take portable darkrooms with them in order to achieve results. An image produced by electromagnetic radiation passing through a body and casting shadows onto a sensitised plate or digital detector. 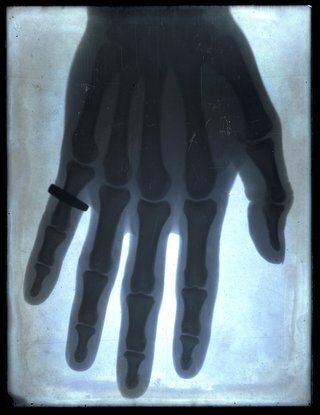 X-rays, which move through human tissue but not bone or metal, were discovered by Wilhelm Conrad Röntgen in 1895 and were first used to view and record the internal structure of bodies in medicine in 1896.